Rickshaw company Fazilka EcoCabs was shortlisted for the SMART Mobility Enterprize. Photo via EcoCabs. Starting off small as a social project under the Nirmal Foundation, he sold the idea to 1,000 drivers in Ahmedabad and gradually got several more on board. Today, in the cities of Ahmedabad, Baroda and Gandhi Nagar, G-Auto has 10,000 rickshaw drivers and several thousand happy customers. Although the idea isn’t revolutionary, it has dramatically changed the rickshaw landscape, connecting passengers to rickshaw drivers, offering honest, safe and reliable para-transit services. 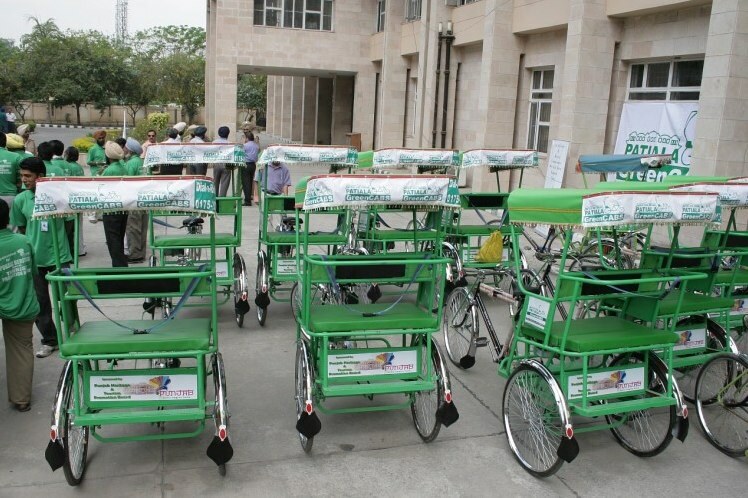 Another entry shortlisted for the award is Navdeep Asija’s Fazilka EcoCabs, set up in 2008 with the mission to organize and improve the existing cycle-rickshaw operations in the town of Fazilka, Punjab. Using modern management tools and real-time technology, this dial-a-rickshaw service promotes an environmentally friendly and sustainable para-transit mode of public transport, as an alternative to car-centric development. This system can be used as a feeder to mass rapid transit and achieve low-carbon mobility. Navdeep started off with 500 cycle-rickshaw “pilots,” as he likes to call the drivers, and launched the world’s first dial-a-rickshaw service with cycle-rickshaws using five call centers. The project uses an advanced mobile phone-based intelligence system that connects users to rickshaws, building on the core commitment of EcoCabs, which is accessibility and quality of service.